To understand how a market maker hedges the price risk from inventory changes by applying delta hedging and other delta based option trading strategies. To gain experience with real world option support systems. Delta hedging and trading in a world where prices evolve in continuous time but trading takes place at discrete points in time (approximately every two weeks*). Trading takes place in an idealized constant volatility world. You get to adjust your position at realized bi-weekly prices. In this case you will be trading for a firm that makes money from trading options for clients at a "premium" above its estimated competitive market price. Your trading problem is to hedge this source of profit from option trading activities. In the FTS markets, stock prices will evolve in continuous time, but you can trade only at discrete points in time. Your trading performance is evaluated by the amount of money you make as well as ensuring that the market value of your position does not fall below a pre-specified floor. This guarantees that the profits from option trading activities do not fall below target levels. In the FTS markets you will have access to a set of real-time analytical support tools that enable you to monitor the delta of your position at each point in time. 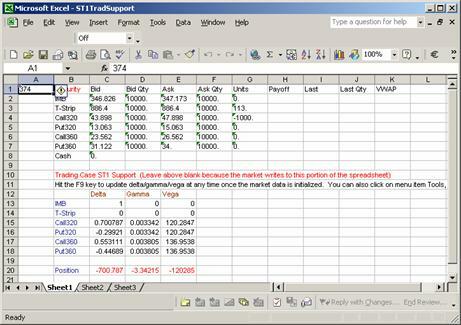 The description of how to link the FTS Trader to the real time support system is described at the end of this case. In addition, due to the recent weakness in the IMB stock, analysts forecast no dividend payments over the next twelve months. 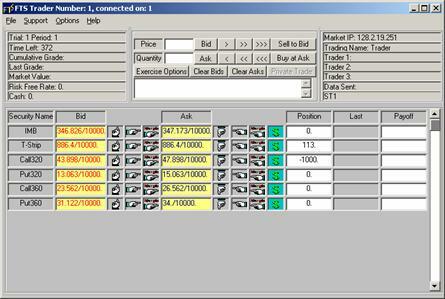 Trading in this stock is permitted at the displayed bid/ask prices that are updated bi-weekly. At the end of twelve months each share you own is marked to the realized market price. The second security market trades a zero-coupon bond with zero default risk. This is known as a Treasury strip. This strip security pays $900 at the close of the market regardless of which path the stock market takes. The third to sixth securities are European options (call/put/call/put for securities 3, 4, 5 and 6 respectively) defined on one IMB share. The strike or exercise price for these options are 320, 320, 360, 360 respectively. That is there is a put and call option for each strike price. Security 4, for example, is the put with a strike price equal to 320. The time to maturity for each option is approximately twelve months and the terminal payoff for each option depends upon the realized value for IMB after the FTS markets are closed. At the end of their life, options are automatically exercised if they are "in the money." As traders your task is to manage the exposure of your position to price risk. There are two types of initial trading endowments that you may start with. These are referred to as type A and type B. Each position type reflects the different option trading activities of a firm. If you are type A then you have an initial non-tradable position in call options. 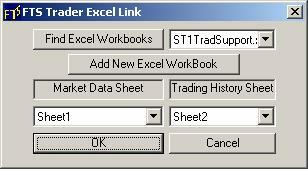 If you are type B this non-tradable position is in put options. Implicit in each initial position is a "profit" from trading call options (put options) with clients at prices slightly higher than theoretical prices. In both cases this profit is approximately $53,500 market cash, and your trading objective is to lock into a floor to this profit for the firm. You can trade in the stock and the treasury strip markets. Up to 10000 shares can be purchased or sold in these markets in any one transaction (i.e., one click of the mouse). You can trade a large number by repeating a transaction many times. Option trading is not permitted. As a result, you must manage your position's exposure to price risk by only trading in the stock and treasury markets. Shortselling in the stock and treasury markets is permitted. This allows you to borrow (lend) at the risk-free rate by shortselling (buying) treasury strips. Holding market cash pays zero interest and borrowing is not permitted in the cash market. If you want to buy securities but have insufficient cash you must first shortsell the required amount of treasury strips and then purchase the desired amount of stock. The spot risk-free rate of interest for a Treasury strip is currently 3.25% per annum . This rate is not expected to change over the next twelve months. You can make money by buying and selling securities for market cash over approximately twelve months of calendar time. This period of time is referred to as one trading trial. At the start of a trial your initial endowment is either type A or type B, and an independent path for the stock prices is generated (starting from the spot price of 347). Above $200,000 market cash earns the maximum grade cash for one trial which is $10. * The exact length of time a period maps into is 15 seconds between ticks divided by a total of 375 seconds for the year. So this is just over 2-weeks (0.04*52 = 2.08).